The British Gazette » Four cats, but only two are really dangerous! 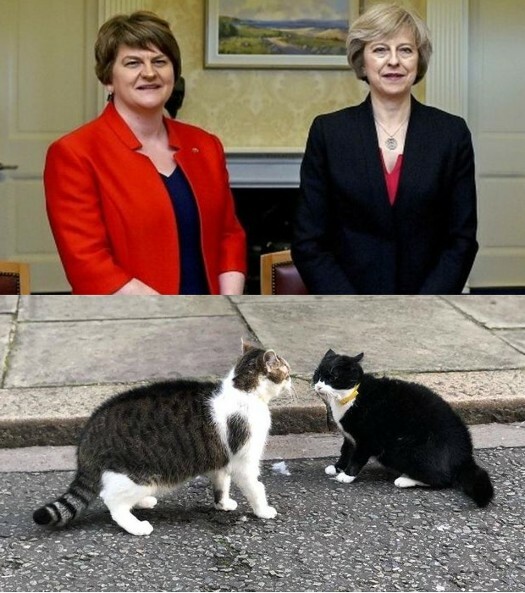 Bottom picture, Larry, Chief Mouser to the Cabinet and Palmerston, Chief Mouser to the Foreign & Commonwealth Office having a disagreement. Several “Brexiteer” politicians have commented over the past three years that negotiations with the EU “go right down to the wire”. Not however in the Brexit case however! The negotiations – betwixt the UK and the EU have finished when the Withdrawal Agreement was concluded. The negotiations between the Tories and the DUP however are indeed going right down to the wire! IF – and past failures indicated likely – Madame succeeds in getting the Withdrawal Agreement approved via “Meaningful Vote 3” this coming Tuesday, it will be due to several lorry loads of “sweeteners” delivered to Mrs Foster’s political doorstep! IF the Deal is ratified then Brexit Day appears to be Sunday 30th June 2019 at 11PM (BST). IF this turns out to be the case, the objective MUST be to see to it that the ongoing agreement between the EU and the UK must be an EFTA+EEA agreement along the lines of Flexcit.